I fear that I am unconsciously subverting my daughter into adopting a passive stereotypical female role. I know all about patriarchy in action and various incarnations of Feminism from my grad studies. I deliberately sought out Feminist criticism classes so I'd be equipped to raise a ferocious female leader. I'm most definitely better off now than what I was before these classes. Still, I get sinking feelings that it's all for not when princesses and fairies are popular with the little one. I don't want them to be passive fictional role models and I try to create a fantasy that princesses and fairies can be empowered, action oriented characters for a little girl so long as her imagination has the lexicon. I think I'm burying my head in the sand. 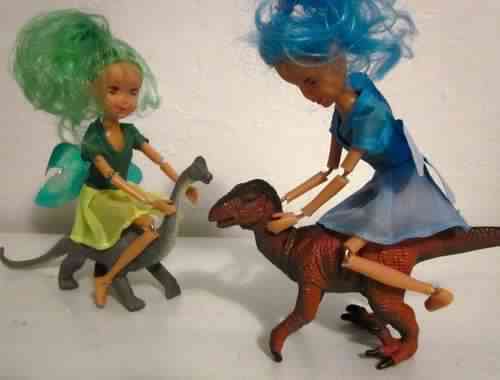 It makes me want to take all of her 'dolls' and turn them into 'action figures' like this.